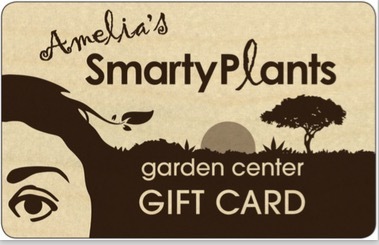 Thanks to you, our loyal customers, SmartyPlants had a 2-year anniversary last week. Can you believe that we've been here for 2 years already? Time DOES fly when you're having fun. We couldn't have done it without you. Thank you for you business; we are very grateful for your support. It scares me to think that the holiday season is upon us once again. It seems like we were doing Poinsettias and other holiday things not too long ago. And here we are planning to do it all over again. I'm reminded of the movie Groundhog Day. Christmas Cactus are here and Poinsettias will soon arrive. 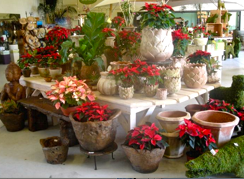 We order our Poinsettias from a grower just outside of Orlando. They supply Poinsettias to Disney World, so you know the plants are nearly perfect. Last year we placed 2 orders - we ran out of plants quickly the first round, and it was too late in the season for the second round. So, in order to get the best plants and have enough for everybody, we'd like to try something new this year by giving you the opportunity to pre-order. Our order must be finalized by Friday the 16th. Let us know how many plants you would like by end-of-business Thursday November 15. 6.5" for $16.50 10" for $85. 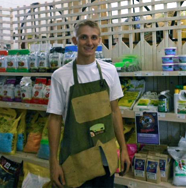 You will notice one more new smiling face at SmartyPlants - Garrett Prouty. Garrett, a resident of Lake Worth, is likely to ring your order at the register or load your plants and/or mulch in your car. He is happy to help in any way he can, so don't hesitate to ask. If he doesn't know the answer, he will find it for you. The SmartyPlants team is happy to have Garrett as a team member. 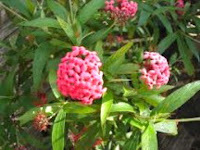 This month we offer you Osmoxylon - Miago Bush - as our Plant of the Month. 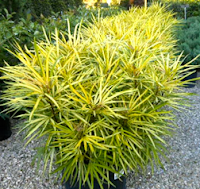 This interesting shrub needs sun to maintain its bright yellow color. Otherwise, the green tones become predominant. It's a slow grower and can get up to 4 ft., but can be kept shorter - but why would you want it shorter? The more of it the better. 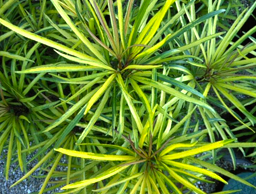 Its texture makes it an interesting and unusual choice for the garden. Create contrast by planting with reds (i.e., Bromeliads and Cordylines) and blues (i.e., a blue ceramic pot). It likes water so it's not a good choice for mass plantings or in drought conditions, but great as an accent plant or in a pot where it can be watered as needed. Weed and Feed - For the past few months, weeds in your lawn may have been running amuck. The time to chop their heads off is here. For a weed-free lawn, apply weed-and-feed this month. This exercise is recommended no more than twice a year, and now is a good time to do it. Ganoderma and your palms - Ganoderma is a deadly palm disease that is caused by the fungus Ganoderma zonatum. 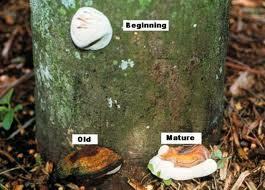 When your palms have Ganoderma, you will notice a hard conk on the lower part of the trunk. A decay in the tree will be evident. The disease spreads by spores released by the conk, so it is imperative that you remove the conks as soon as you notice them. Throw them away in the trash in a sealed bag so the spores are not released. Unfortunately, there is no cure for the disease, so the tree that is infected will decay and eventually die. It is recommended that you don't plant another palm in the same space of the infected one(s) as the soil may be contaminated. Star Jasmine 7-gal. size is 20% off. These plants are huge and dark green. Use them as a single plant or in a row to create a low hedge. A 7-gal size is great for instantaneous gratification. Panama Rose, Rondeletia, 7-gal size are beautiful and full of buds. 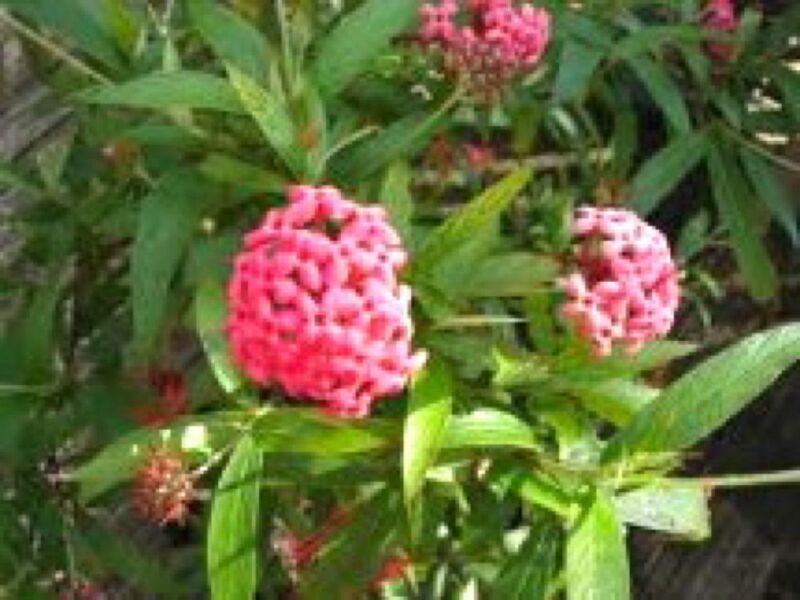 If you have or want to have a butterfly garden, this plant must be included. It is 15% off this month.